The chair consists of a carved top rail with diamond design, the lower rail having a simpler rope design with three turned spindles joining the two rails, the uprights being reeded. This leads down to a rope seat with turned legs to the front supported by square tenoned and pegged rails. It is hard to put a definite age on this piece, but due to the construction and patination we have dated it as circa 1700, although it could even be earlier. The chair is in very good original condition, is of stable construction and can go straight into a home or collection. 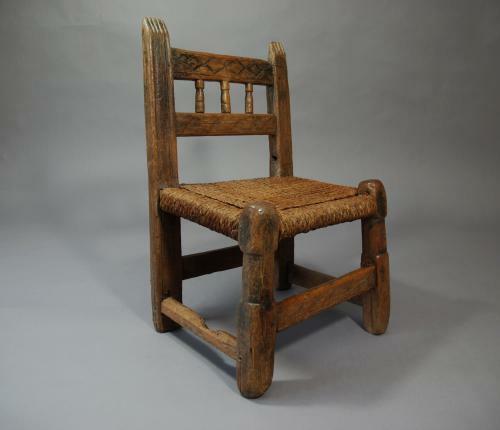 This chair is possibly more of a collectors' piece as due to many years of use it has rather a twisted form which certainly adds to its' character.